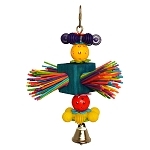 14 x 10 x 10 "
The Orbiter consists of a sturdy steel frame wrapped with soft 100% cotton rope. 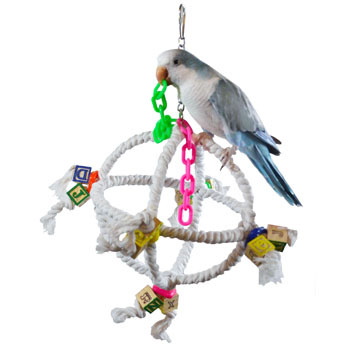 Wooden blocks, plastic chains and rings are added to keep your birds playing and hanging out for hours. 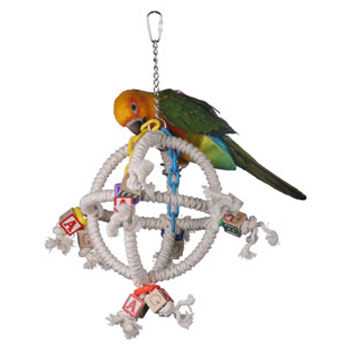 I must say I LOVE LOVE LOVE this toy and so do my birds...parrotlets and conures! They love crawling inside and out. Q: How should I clean this? A: You can clean rope toys by brushing or scraping off any solid waste material and then hand washing them with soap and water followed by a thorough rinse. 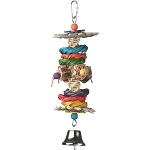 These items should be dried thoroughly before returning them to your bird's cage. Q: Would it be relatively simple to replace the metal chain this hangs on with something different? I'm always worried about feet getting caught in chains. Thank you! A: Hello! Thank you for your inquiry. It wouldn’t be difficult for you to alter the Orbiter if you wished. 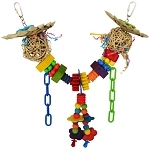 The metal hanging chain and the plastic chains are attached via an o-ring, and that can be opened using two pliers. 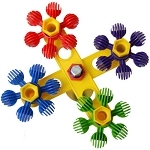 You could remove the metal chain, and either hang the toy using one of the plastic chains, or you could hang it with a leather strip, paulie rope, or some other cordage of your choice. Please let us know if you have further questions.